Under the Paris Agreement, climate action was anchored in the context of international law. This requires countries to make their own unique contribution to the prevention of dangerous climate change. The next crucial step to follow this agreement is the rapid implementation by the signing parties of concrete measures to make their individual contributions to the global goal. 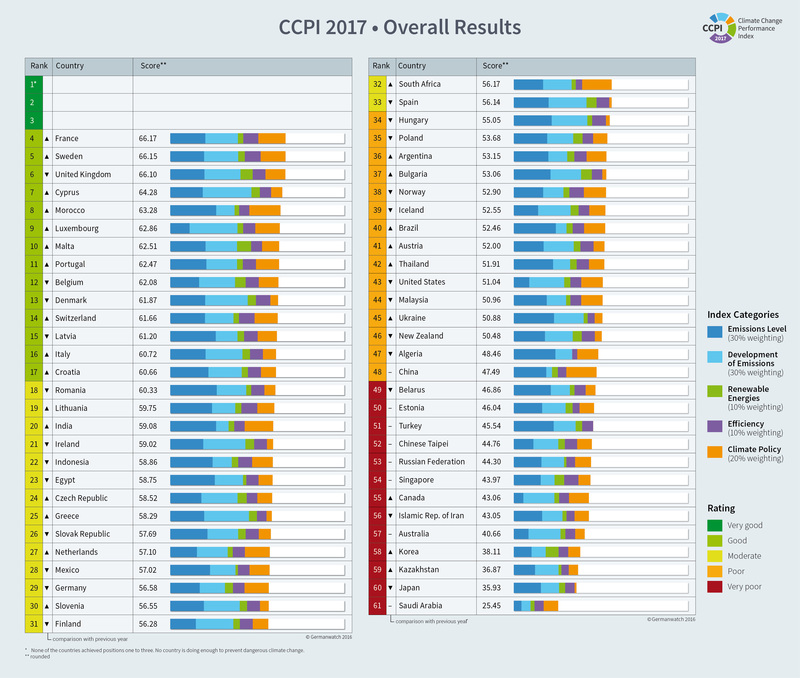 For the past 12 years, the Climate Change Performance Index (CCPI) has been keeping track of countries’ efforts in combating climate change. The varying initial positions, interests and strategies of the numerous countries make it difficult to distinguish their strengths and weaknesses and the CCPI has been an important tool in contributing to a clearer understanding of national and international climate policy. The Climate Change Performance Index is an instrument designed to enhance transparency in international climate politics. Its aim is to put political and social pressure on those countries which have, up until now, failed to take ambitious action on climate protection. It also aims to highlight those countries with best prac-tice climate policies. More than 40 major businesses and trade associations are demanding more climate ambition and a bold implementation of the Paris Climate Agreement in Germany. The companies, from a large variety of sectors, are encouraging the German government to adopt a long-term Decarbonisation Plan with a climate target at the upper end of the current target range of an 80 to 95 per cent reduction in greenhouse gases by 2050. Businesses need interim sector targets for the power, buildings, industry, transport and agriculture sectors, write the signatories, amongst them the construction major Hochtief, the electricity producer EnBW, the retailer Metro and Commerzbank. The declaration was coordinated by the business associations Foundation 2° and B.A.U.M. as well as the development and environment NGO Germanwatch. Africa is the continent that was hit hardest by extreme weather events in 2015. According to the 12th edition of the Global Climate Risk Index, four out of the ten most impacted countries globally are African: Mozambique (Rank 1), Malawi (Rank 3), Ghana and Madagascar (both Rank 8). "Especially flooding affected the hosting continent of this year's climate summit", says Germanwatch's Sönke Kreft, main author of the Index. Heat waves claimed most lives last year. More than 4,300 deaths in India and more than 3,300 deaths in France show that both developing and developed countries are impacted by extraordinary temperatures. Kreft: "Increases in heavy precipitation, flooding and heatwaves are to be expected in a warming world." Since the 2015 adoption of the UN’s Sustainable Development Goals and the success of the Paris Agreement under the UN Framework Convention on Climate Change (UNFCCC), it has become clear that “business as usual” is no longer an option for neither industrialized countries nor the developing world. Both the Agenda 2030 and the Paris Agreement (PA) entail substantial consequences for the world financial system. Mobilizing the massive investment required for climate resilient, low-carbon infrastructure and development, transforming the world economy and hedging the climate-related risk to the financial system form formidable challenges to the public and the private sector alike. In December 2015 the Paris Agreement was adopted, in November 2016 it will come into force. A transformation of the energy-, transport- and agricultural sector is needed, to be able to implement the goals agreed upon and to limit global warming to 1.5°C/well below 2°C. After reaching full operationalization in 2015, the Green Climate Fund (GCF) is gradually moving from a design phase into the actual implementation of projects and programmes to address the adverse effects of climate change in developing countries. To reach its ultimate objective of achieving a paradigm shift towards low-carbon and climate-resilient development, these projects and programmes need to be imbedded in national development strategies and require the involvement of all national actors to be truly country-owned.